We should begin with that Moment, in this Manifesto which chronicles the fragments of perceived time as they ride across the reader’s consciousness. This basket of loose phrases tenuously links the poetic endeavor of the individual with the current crisis we are experiencing in the daily attacks upon our Republic and its Constitution. The content of Manifesto of the Moment is structured by one line epigrammatic sutras, a procession of thought-fragments in flux, the quirky tangled up in the immediacy of the quotidian. Reading through mIEKAL’S phrase-tractatus is like journeying through a distant land, perhaps a passage through an experiential terrain called The Resist Stance. This text is impregnated with whimsically infused brevities; maybe even seasoned well with the enigmatic vectors of au courant observations. 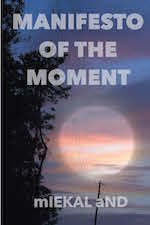 The momentum of phrases found here in Manifesto of the Moment is similar to a process that has been called “disjunctive synthesis”, one used predominately by experimental poets such as Clark Coolidge (Research) and George Quasha (his series of Preverb books including Glossodelia Attract and Daimon of the Moment). For example, Quasha’s preverbs are epigrammatic lines that hold various core notions, blending thought-fragments with seasoned observations, that encourage and spur the reader onward toward some future insight. Disjunctive Synthesis is a process of taking apart the components of language and then reordering those parts in selective ways. In mIEKAL’s chapbook, this reorder has found its flow in a tenuous linkage between narrating elements of the current political unrest, and a phrase-surfing through some unknown flux of quirky quotidian immediacy. His long history of involvement with visual poetry, asemic phraseology, “interwriting”, neologism creation, and experimental collaborations colors the lines within Manifesto of the Moment; a positive cynicism emerges that is apropos of the current level of insanity we are expected to daily absorb with this cardboard character who has usurped the Oval Office. Lines of surreal images get purposively tangled up with a droll humor in these ophaned lines - one proceeds obliquely, yet with a resolute sense, pocketing the phrases as a necessary currency for our daily Resistance. Residing in the southern part of Northern California, Matt Hill is a sculptor, poet, and fiction writer. His poetry, prose, and fiction can be found on many Internet venues, including BlazeVox Books, Argotist ebooks, and Gradient Books. Integral Process: Selected & Recent Poetry and Prose is his latest work.